I was delighted to meet Esmé through mutual blogs that we follow. We are practically next door neighbors (she’s in Vancouver and I’m on Vancouver Island). 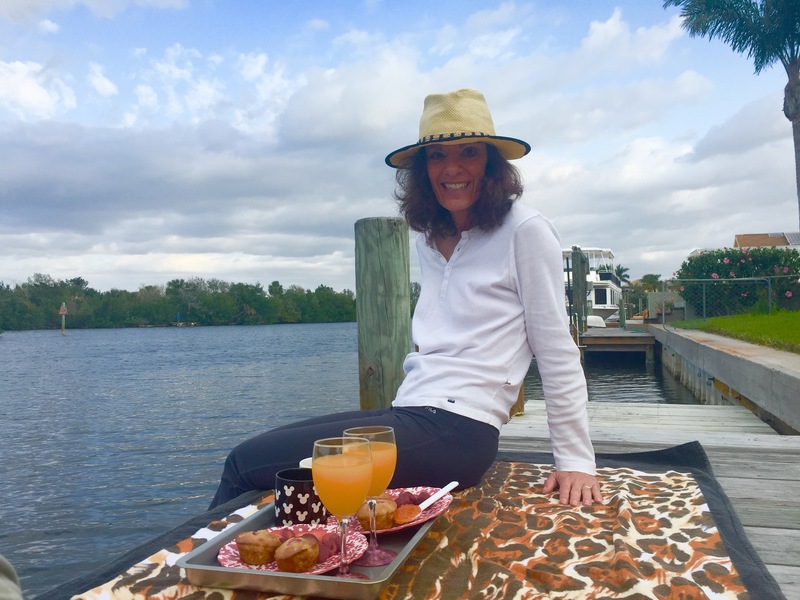 I admire how Esmé generously shares tested, tasted and well-loved recipes from around the world and warmly invites others to send in their contributions. I was honored to be asked to write a post for her. 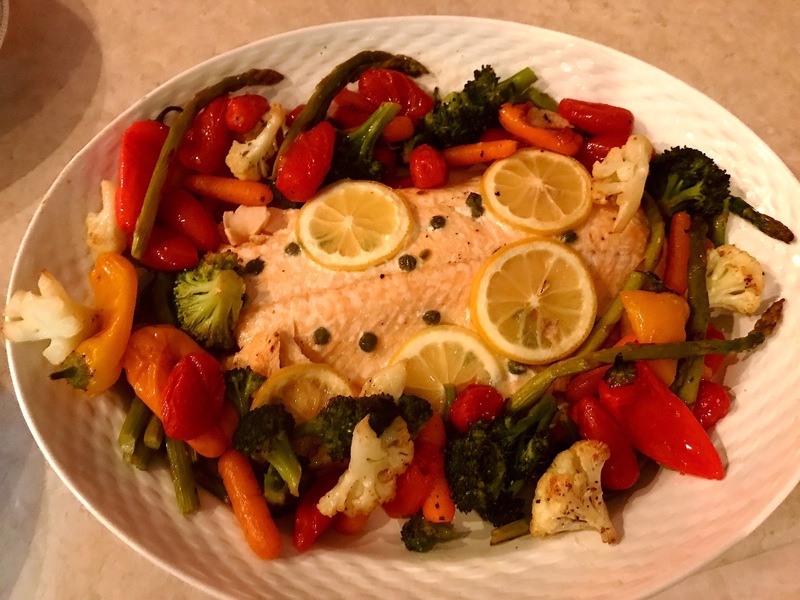 We had company over for dinner last night and I prepared one of my favorite no-fuss-no muss meals — roasted salmon and veggies. As this is one of my go-to recipes, I thought it would be a perfect one for sharing. I initially discovered this dish via Chatelaine Magazine online. Chatelaine’s recipes are always triple-tested. They are easy to shop for and the instructions are clear and straightforward. As on Esme’s blog, Chatelaine’s recipes are also tested in home kitchens by non-professional cooks. Here is Chatelaine’s recipe for Salmon and Asparagus Sheet Pan Dinner. PREHEAT oven to 425F and line a rimmed baking sheet with parchment. LAY salmon skin-side down on prepared sheet. Sprinkle with 1/4 tsp of the salt. WHISK lemon juice, 1 1/2 tsp of the oil, lemon zest, capers, 1/4 tsp of the salt and 1/4 tsp of the pepper. Reserve 1 tbsp lemon mixture. Spoon remaining sauce over salmon. Bake until salmon flakes easily with a fork, 12 to 15 min. DRIZZLE reserved lemon mixture over asparagus, then sprinkle with dill.Serve with fresh lemon. If you know me, you know that I seldom follow a recipe in its entirety. But I do adhere to this one fairly closely. The main change that I make is in oven timing. In my oven, at 425F, 800 grams of fresh Atlantic Salmon takes 25+ minutes to cook. I also add the lemon slices to the salmon prior to baking, so that the salmon is continually basted in juices while cooking. Finally, being a veggie-lover and an ‘all in one pot’ kinda gal, I prepare a second sheet pan of bite-size portions of vegetables (usually cherry tomatoes, small sweet peppers, broccoli florets, small pieces of cauliflower and mini baby carrots) and drizzle them with olive oil, salt, and pepper. I tend to avoid potatoes, beets and larger vegetable pieces that take longer to roast. Remember not to overcrowd the vegetables which can cause them to steam and go mushy! 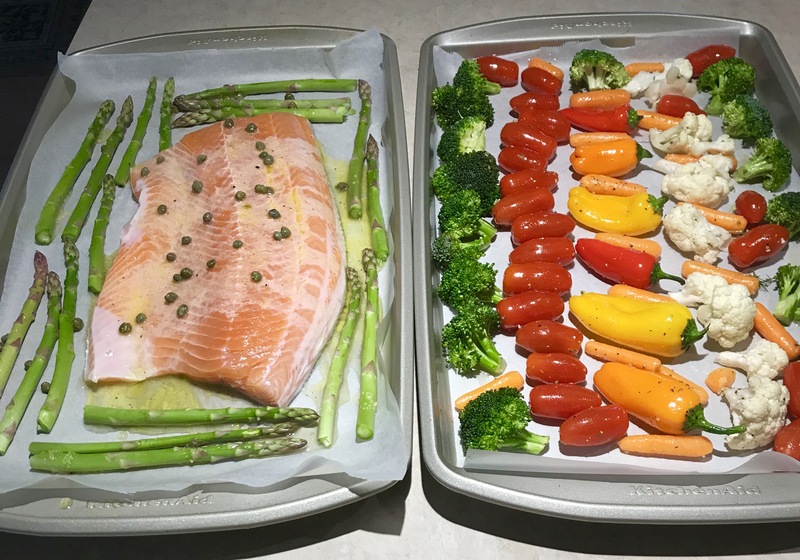 I then bake both sheets (veggies in the top third of the oven, salmon on the bottom third) at the same time for approximately 25 minutes at 425F. Here’s what it looks like when everything is ready to go into the oven (oops except for the lemon slices that I added at the very last moment). Our guests dug in, and all salmon and veggies were quickly devoured. I’ve made this meal for company many times before and always find that it is easy, stress-free and generates many compliments. It is also colorful, flavorful and loaded with nutritional value. Now that’s healthy eating at its finest! What’s your favorite go-to meal? I’d love to read your suggestions. About Donna: Donna lived in Beijing, China for fourteen years. Leaving international life behind, she and her husband retired to Vancouver Island, Canada, in June 2015. To document this transition, Donna initiated ‘Retirement Reflections.’ Her favorite part of blogging is the interaction with others. You can connect with Donna in the comment section below, or via the following social media sites. I am saving this one for the next time the wild salmon at my local market is available. Sounds delicious!! Thanks! I used Atlantic Salmon for this particular dish. This recipe also works well with our local Wild Salmon (that latter just cooks a bit faster in my oven). Thanks, Reena – It is a pleasure to meet you at Esme’s blog. I am on my way over to your site now. Thanks, Sam – This dish has always been a big hit with company … and allows me plenty of time to visit with guests away from the kitchen! Oh, that looks yummy and so easy, can’t wait to try it. After a hike, this will be just a perfect end to the day with such a lovely meal. I am fussy about fish and a big fan of wild salmon. This looks like a yummy recipe, Donna. I like that it is easy and stress free. And nutritious, too! Hi, Molly – I love fish, but have only ever ventured into cooking salmon (while ignoring the other varieties out there). My plan is to quit stalling and attempt a non-salmon fish recipe soon! We cook haddock and scallops here in Maine. I don’t cook them but enjoy mussels and clams when I eat out. And of course, there is always lobster and shrimp, but I am allergic so don’t put them on the menu. But I can eat crabmeat and love to make crabmeat rolls for cool summer meals. I say I’m not into seafood much, but as I type this I realize I do like a lot of different seafood items! I just love seafood. My Dad use to go fishing and scuba, so did I so most seafood is awesome. Hi, Molly – You should share your haddock and scallop recipes here….with a side plate of your wonderful humour! I agree – ‘easy to make’ and ‘delicious’ are essential. My husband is also insisting on ‘healthy’. There’s a pooper to every party! Healthy is good, but you need to treat yourself once in a while and enjoy the not so healthy food as well. Do you do mail order delivery, Donna? That looks delicious! My eyes caught that roasted cauliflower…yum! Hihi 🤣 mailing it you may get some funny stuff and not salmon arriving at your doorstep. Jill, how about you try it out and also I would like to know if you would be interested to do a Guest Post. What do you think?? Hi, Jill – Mail Order of our favourite recipes would be wonderful! I’m sure with immediate “Drone Delivery” this could seen be a reality. Thanks so much for dropping by! I can almost see the drones taking this salmon across county …. Thanks, Lynn – This is a very user-friendly recipe. You’ll be surprised just how easy it is! Chef Donna – We for sure need to meet in person. You’re not that far away, just on the other side of the big pond. I love salmon too. Of course, the best salmon of all were the ones we used to catch ourselves in northern BC. Jude, now you’re talking, BC salmon, the best. Hi, Jude – Thank you for visiting here. I agree, there is nothing like BC Salmon! I’m a big fan of salmon and veggies (as long as the veggies aren’t beets 🙂 ) so this is definitely a keeper. I also like to have a variety of uncomplicated, but impressive dishes to serve guests. Even better if they don’t require a lot of kitchen time while I’d rather be entertaining. Yummers! Yes, always better to have a dish that you can do upfront or one like this and you have more time with the guests. Talking about Guests, Would you be interested to share a post here as a Guest? I second that!! I would love to read one of Janis’ recipes here — especially one of the ‘uncomplicated’ but ‘impressive-for-company’ ones that she mentioned! Janis, what do you think???? Hmmmmmm… I’d love to do a guest post, but I’ll need to think about the topic. I may want to do a favorite recipe, or I may want to do something recipe-related, but different… would that be OK? This looks delish!! And easy too. Hi, Laura – Thank you so much for stopping by and commenting. I greatly appreciate it! Hi Esme and Donna, Looks YUM. 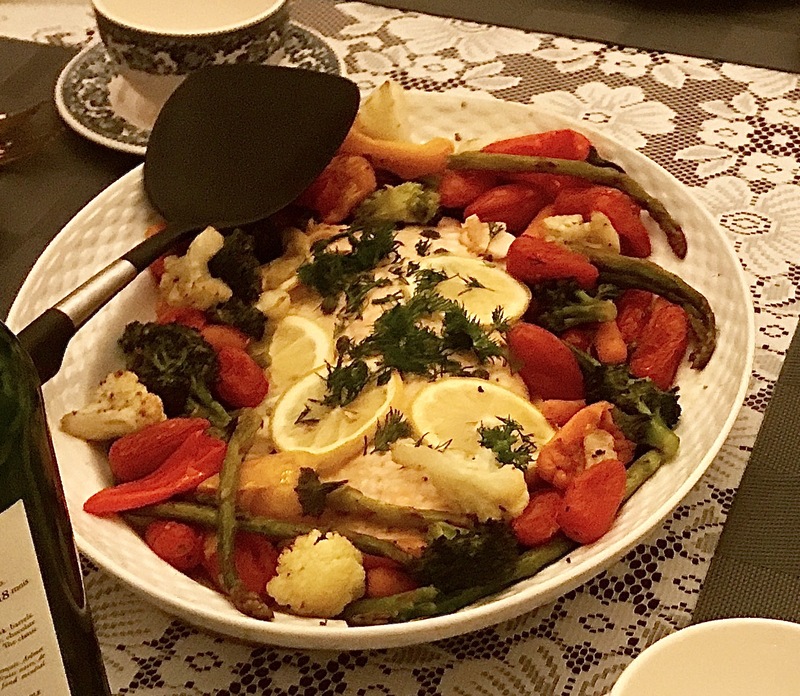 Salmon ( Australian ) and roast veggies is one of our family favourites too. Looking forward to exploring your blog Esme I need some help to find my cooking mojo. Louise . Welcome here Louise. glad you made it over and hope you find something nice to test out and enjoy. BTW I love your blog and quickly popped over and would like to know if you would be interested to share one of your trekking stories here with us? I think our readers would love that, what do you think???? Hi, Louise – Thanks for stopping by. I highly recommend Esme’s blog to you. It is an excellent source of cooking inspiration! Louise, let me know if you’re looking for anything in particular or search the category drop-down. Looks like a great recipe. I’ll definitely give it a try. I’ll leave off the capers – not a fan – but doubt that will negatively affect the dish. But one question – also not a huge fan of dill. I know, I’m picky! Is there a strong dill flavour or a barely there one if I make the dish exactly as you’ve given? Hi Karen, I will leave Donna to answer your questions, but thank you so much for popping over and hope to see you more and would also love to know if you would like to showcase your blog with a Guest Post here with us? Please think about it and let me know. Hi, Karen – Thanks so much for stopping by and commenting. I’ve skipped both the capers and the dill before and it was still a lovely dish — no problem at all! I love salmon Donna and the addition of capers would be perfect. I’ll be trying this recipe and it looks delicious as well as healthy! Hi Sue, Thanks so much for visiting, and I for sure agree with you, this is an awesome recipe to try out very soon. Would you like to tell your own story and I quote you re: Life is there to be lived and I’m going to be sharing my thoughts and experiences about this fabulous time of life. Thanks, Sue – I agree that this dish fits in well with your healthy eating goal. When you try it, please let me know what you think. This is great. I live in the NW too and salmon is a staple around here. I’m always looking for new ways to prepare it! Donna, what are you waiting for, get that salmon out and you cook up a storm. Wonderful dish, Donna! It sounds and looks tasty and incredibly healthy. A winner! I love how you can put everything in the oven at the same time, and… all of a sudden, while you hang out with your guests… dinner is ready! Thanks for visiting and dropping by Liesbet. I love your blog, and adventures and read your awesome about page. WOW WOW WOW. I will be honored if you would like to submit a Guest post here with The Recipe Hunter. Hi, Liesbet – I LOVE that too! Other than this dish, I mostly prepare “make-ahead” food for company (so that I can repair any disasters without our guests ever finding out)! But this dish is so easy and foolproof, it cooks itself perfectly ever time. PS – I would love to read a Guest Post from you on Esme’s blog. Perhaps your secret vegetarian pizza recipe?! Liesbet this does sound promising, you can even do more than one post 😉😉. I look forward to hearing from you. I love it. Why don’t my meals ever look that pretty? 🙂 Seriously, though, that looks like a picture in a magazine. I bet it was delicious. Christie I am sure your meals does look and taste as good as this. How about you share with us a story from your blog here, no need to be a recipe, any guest post would be appreciated. I love your Blogging Grandmothers Link Party, was not aware of that and as a Grandmother, would love to participate if accepted to the group. Hi, Esme – We would all love to have you join the Blogging Grandmothers’ Link Parties. Just follow Dee at https://grammysgrid.com/ and you’re in! You can also access this Link Party through Christie’s or SizzleSue15’s blogs. I look forward to seeing you there. That is so kind of you to say, Christie. The pictures are quick snaps from my iPhone. It’s the bright colours from the vegetables that make the difference. Oven roasting is definitely my favourite way to prepare veggies! I eventually made it over to Dee and subscribed – thanks again for the link and hope to share some Grandmotherly love around. and participate by sharing your posts and other social media there as well. Thanks in advance for looking at it. Sorry, I’m a little bit late to the party. Any salmon or veggies left? They look delicious and are healthy, too. Thanks, Donna, for sharing your recipe. Never late. Thanks for dropping in. I am sure we can get some salmon for you as well. Hi, Debbie – Thanks so much for dropping by and reading my full post here. I would love to read one of your recipes on Esme’s site! WOW – Debbie, do I see a possible Guest Post coming up from your end??? Those roasted veggies are the perfect accompaniment to almost anything. We make a veggie stack that begins this way and gets layered with ricotta cheese and a red sauce. It’s a “go to” favorite for a quick company meal in our home. Adding capers and dill to the preparation of the salmon is a good alternative to adding them to the classic dipping sauce that traditionally accompanies this dish. Who needs the extra calories! Beautiful presentation. Love your way of doing your veggies. Something to keep in mi d. How about you also share with us a Guest post, that would be awesome. I would love to. Just let me know when you need something. Hi, Suzanne – I like your idea of layering the roasted veggies with ricotta cheese and red sauce. I would love for you to share the recipe if you have a moment. Mmmmm looks very delicious!! The trick I think with both salmon and veggies is not to OVERCOOK them. I love salmon cooked on the rare end of the spectrum so it does not dry out and retains it’s flavor and veggies need to remain crispy to be good. Thanks for sharing! Wish we could get salmon in Sri Lanka but so far everyone eats tuna here, which I avoid due to the overfishing issue and mercury issue. Hi Peta, thanks for your input, I totally agree with you and do the same with salmon and the veggies.